University of Split, Faculty of Civil Engineering, Architecture and Geodesy organizes a summer school for eight different courses in the area of civil engineering, architecture and geodesy. Each program offers an unique opportunity for students to develop the offered skills and at the same time enjoy their summer in one of the most popular tourist destinations in the Mediterranean. The goal of STSS is to enable students from different countries and educational backgrounds an experience of multicultural and interdisciplinary studying with focus on one of the eight subjects, while actively networking with each other and lecturers. Students who successfully complete any of these courses will be awarded 2 ECTS (European Credit Transfer System) credits. An assessment is based on classwork and final presentation. The program is accredited by The Quality Enchancement Centre of University of Split. University of Split, Faculty of Civil Engineering, Architecture and Geodesy organizes summer school for seven different courses. 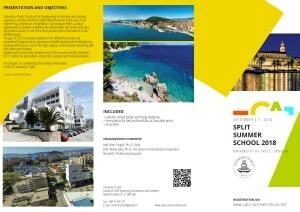 To apply for Split Summer School 2018, please use online registration system by clicking the button below. Feel free to contact us if you have any questions. Please visit How to apply? to see the application procedure and important dates. Students who successfully complete this course will be awarded 2 ECTS credits. See what we were doing last year in gallery down below! Here is a sneak peak what we were doing in 2016!